Heat oven to 325°F. In small skillet, brown pork sausage with onion and celery. Do not drain. In large bowl, combine stuffing cubes, parsley, poultry seasoning, salt, pepper and margarine; mix well. Add apples, raisins, broth and sausage mixture with drippings; mix well. Remove and discard neck and giblets from turkey. Rinse turkey inside and out with cold water; pat dry with paper towels. Spoon stuffing loosely into neck and body cavities of turkey; do not pack tightly. Set aside remaining stuffing. Turn wings back and tuck tips over shoulder joints. Refasten drumsticks with metal piece or tuck under skin at tail. Fasten neck skin to back with skewers. Place stuffed turkey, breast side up, in roasting pan. Insert meat thermometer so bulb reaches center of thickest part of thigh but does not rest on bone. Tent foil loosely over turkey. Bake at 325°F. for 3 1/2 to 4 1/2 hours or until meat thermometer registers 165°F. and drumsticks move easily when lifted or twisted. Removing foil during last 30 to 60 minutes of baking. Baste with pan juices several times during baking. 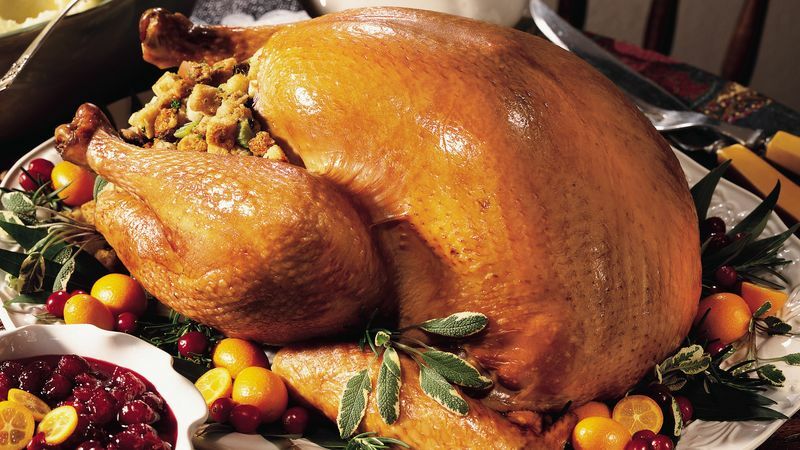 While turkey is baking, mix remaining stuffing with additional chicken broth or water to moisten. Spoon into slow cooker. Cover; cook on HIGH setting for 30 minutes. Reduce setting to LOW; cook until serving time. Mix lightly before serving.